With our heads full of "gospel" songs, we may not have "stack' banana till the mornin' come", but when we went out last night it was Barry and Claudette's thirty-somethingth wedding anniversary, and by the time we found our way into the warmth of our bunk it was mornin' already - only just, but mornin' none the less. When the daylight kind of morning did come, we didn't actually take much notice of it to be completely accurate in our reporting, as it had come entirely too quickly for either of our likings. But, we had had a delightful evening in Port-sur-Saone, and today is Sunday, a day of rest for even the wicked, or travel for those who would otherwise be sitting round waiting for Monday. With sleep still in our eyes and coffee in hand, we resumed our downhill slide towards Auxonne on a river which looked ever so much less angry than it has for a week, just happy to be gently on the move. Today's tunnel, that of St-Albin did provide an interesting if quite spacey diversion. 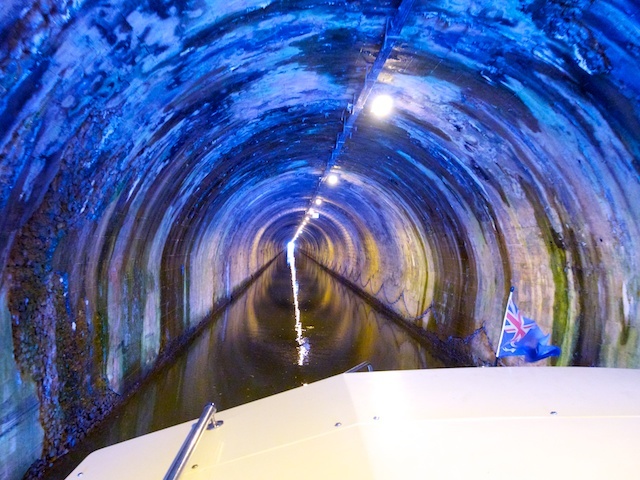 We always like tunnels for the disorienting-floating-in-a-tube sensation they provide. This one got positively trans-dimensional with it's combination of smooth walls, odd algae and moss colours, their efflourescence, and a mix of lighting types designed to confuse the camera if not the eye. No, in life it isn't really as vibrant or luminous as the photograph would have us believe, although it has not been retouched, but the colours were none the less quite psychedelic and the trip was quite enjoyable thanks very much, for all of its six hundred and eighty delightful metres. We were in space, possibly not outer, but space none the less. Our kind of space is not silent and tranquil though. It's got a sort of echoing low thumping rumble and the pots and doors rattle, and it's smokey and it smells like old Perkins.